In April 2011, the H.E.S.S. telescopes targeted the object 1RXS J142209.1-174546 as a potential source of very high energy gamma rays. In a total of 5 h of data, no significant gamma ray excess was detected from this target. The data, however, provided a truly serendipitous discovery in the field of view covered by the telescopes: over a period of about 15 minutes, a strong and variable gamma-ray signal was detected, somewhat offset from the center of the field of view (Fig. 1). 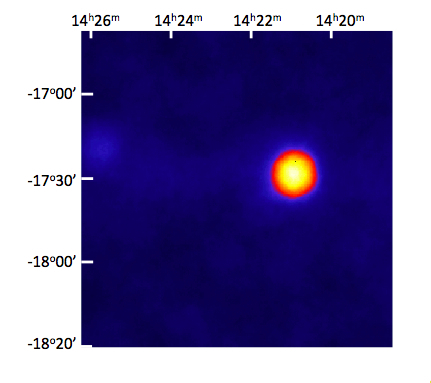 The gamma ray excess is located at approximately 14h 20m 53s in Right Ascension, -17d 28’ 45” in Declination, with a 20" error in either coordinate, and the angular extent of the gamma ray excess is consistent with a point source of gamma rays. The highly significant gamma-ray excess corresponds to a gamma ray rate of about 10 times the gamma ray flux from the Crab Nebula, but has a completely unusual energy spectrum, consisting of two peaks at roughly 270 GeV and 700 GeV, with a width consistent with the energy resolution of the instrument (Fig. 2). The flux in both peaks is time variable over the 15 min. period, while no significant flux is detected before and after this period (Fig. 3). 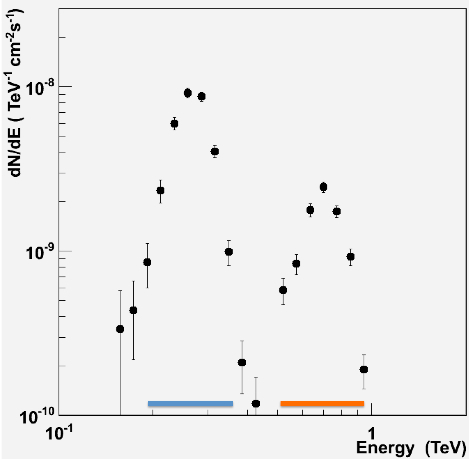 The time variation of the total gamma-ray flux is quasi-periodic, with an excess observed either in the low energy band or the high-energy band, but not in both simultaneously, interleaved by gaps without significant emission in either band. The observed pattern is symmetric in time, with initial bursts of low energy emission, followed by an extended period of high energy bursts, ending again with low-energy bursts. Within statistics, all bursts are consistent with the same source position in the sky. No obvious counterpart could be identified in radio or X-ray data. Since the excess was only detected in the off-line analysis, no immediate follow-up observations were scheduled. Follow-up observations in later periods failed to establish any significant gamma ray flux from the region. It is difficult imagining a natural source of very high energy gamma rays with such a spectrum and time variability. Erratic behaviour of the instrument is therefore the prime suspect. The detected gamma-ray excess, however, remains stable when excluding individual telescopes and also pairs of telescopes from the analysis, excluding failure of a single telescope. Also, the distribution of gamma ray shower impact points relative to the telescopes matches the expected distribution, which would not be expected for artefacts. Similarly, the shapes of shower images agree perfectly with those expected for gamma-ray images. In almost a year of intense work, all suspected instrumental effects were conclusively excluded. While the time sequency could be interpreted as some accelerator mechanism turning on and off again, going from a low-energy mode to a high-energy mode and back again, a natural source of very high energy gamma rays with the observed characteristics is non-trivial to conceive. The quasiperiodic nature of the signal could hint a rotating source or spiraling infall of matter onto a compact object. A free-streaming pulsar wind might create line-like gamma-ray signatures (Bogovalov & Aharonian, 2000), but the relatively long period argues against a pulsar origin. A mechanism which might provide very hard spectra with fast variability is magnetic reconnection (Drury 2012), e.g. in striped pulsar winds, but rather contrived models are required to reproduce the observed spectral/temporal characteristics. For an origin in an Active Galactic Nucleus (AGN), the variability is very fast and while AGN may under certain circumstance create rather hard gamma-ray spectra (Lefa et al. 2011), it is difficult to explain line-like emission. One remote option is that these signals might be of artificial origin, representing the first positive result of a long search (see e.g. SETI instute). 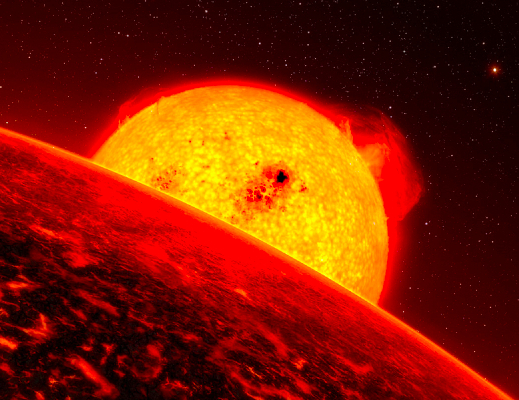 In fact, within errors the source location coincides with the planetary system HD 125612 - a yellow star with three planets and a distant companion star (top illustration). However, while one might be tempted to interprete the time sequence as some kind of Morse code, the time symmetry of the pattern seems to disfavor this interpretation. Nevertheless, we note that the seemingly prohibitive power requirements could be overcome by stimulating an amplification mechanism in a natural source, or by employing a coherent production mechanism resulting in extreme collimation of the beam. Like in case of other observations which intially seem to go beyond well-etablished physics (OPERA Collaboration, T. Adam et al., 2011) we therefore make the data open and urge the community to discuss possible causes and interpretations of this signal, either in terms of an overlooked problem with the instrument, in terms of man-made phenomena, in terms of known physics processes, or in terms of a message from space. A publication is in preparation, describing in detail the data and various tests carried out so far. Fig. 1: Map of gamma ray flux detected serendipitously in the field of view of observations targeted at 1RXS J142209.1-174546 in the night April 5, 2011. The shape of the gamma ray source is consistent with the angular resolution of H.E.S.S. Fig. 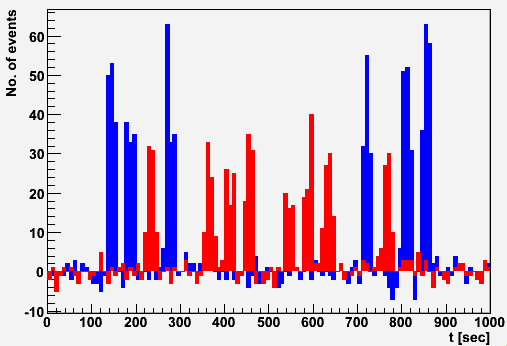 3: Rate of gamma rays detected in the low-energy peak (blue) and in the high-energy peak (red) of the gamma-ray excess, for the burst period in April 2011. Data is presented in terms of counts, after background subtraction.